“This has been a tough day when you look at all of the death from one place to the next,” Trump said before flying back to Washington. 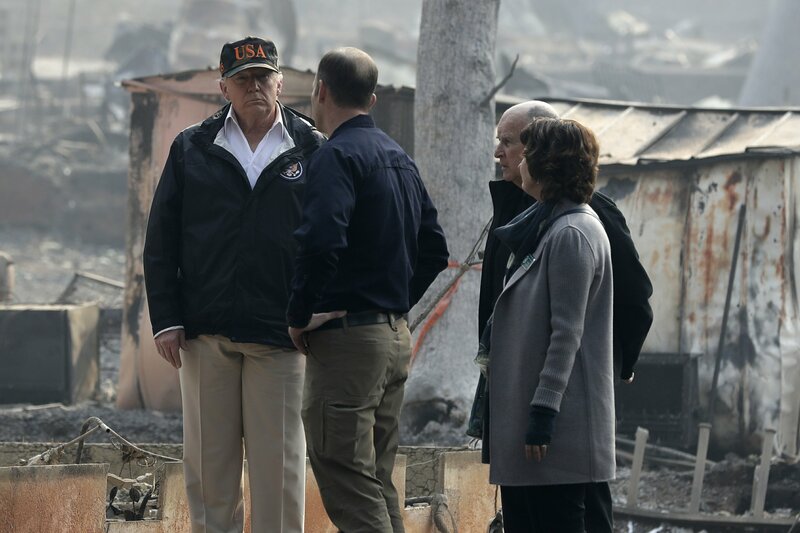 Trump’s visits to areas of Northern and Southern California in the aftermath of unprecedented wildfires that have killed more than 70 people gave him what he sought in flying coast to coast and back in a single day — a grasp of the desolation in the heart of California’s killer wildfires. Before returning to Washington, Trump met briefly at an airport hangar with families and first responders touched by the shooting at the Borderline Bar & Grill in Thousand Oaks more than a week ago, which left 12 dead in what Trump called “a horrible, horrible event.” Reporters and photographers were not allowed to accompany the president to the session, which Trump later described as emotional. Trump had made only one previous trip as president to California, a deeply Democratic and liberal state that he has blamed for a pair of overheated crises, illegal immigration and voter fraud. He also has been at odds with the state’s Democratic-led government, but differences were generally put aside as Gov. Jerry Brown and Gov.-elect Gavin Newsom joined Trump in surveying the wildfire damage. Wearing a camouflage “USA” hat, Trump gazed solemnly at the devastation in Paradise. Several burned-out buses and cars were nearby. Trees were burned, their branches bare and twisted. Homes were totally gone; some foundations remained, as did a chimney and, in front of one house, a Mickey Mouse lawn ornament. The fire was reported to have moved through the area at 80 mph. 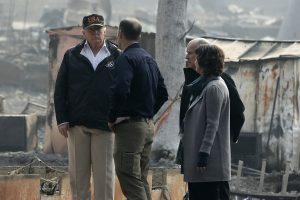 “It’s going to work out well, but right now we want to take care of the people that are so badly hurt,” Trump said while visiting what remained of the Skyway Villa Mobile Home and RV Park. He noted “there are areas you can’t even get to them yet” and the sheer number of people unaccounted for. Brown and Newsom said they welcomed the president’s visit, with the governor suggesting they set aside political differences since it “now is a time to pull together for the people of California.” A fierce advocate of addressing climate change, the governor pointed to several causes and said they need to deal with them.